Someone long ago was once quoted as saying records were made to broken. No,this person was not an angry music critic back in the days of vinyl. Nope, this was a sports personality who had a record broken and that was his answer to a reporter. Well that got me thinking about sports records and I have a list of ones which will go against this line of thinking because I feel they will never be broken. Some are impossible to break due to how a particular sport is played these days and others are improbable but there is a slim chance they could be broken-decades from now. 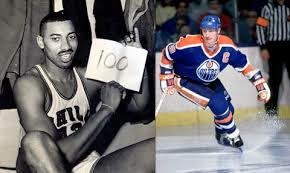 Let’s start with Wilt Chamberlain and his record 100 points scored in a single game. 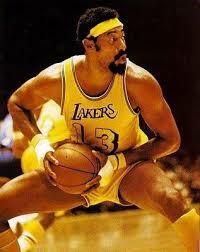 This was done when the key was not very wide and Wilt could straddle it, get a pass and drop the ball into the hoop. No matter, 100 points is stunning, and Kobe Bryant was the last to come close with an 81-point night and most recently James Harden put up 61. The New England Patriots and Pittsburgh Steelers are tied with six Super Bowl wins but that pales in comparison to what the NBA’s Boston Celtics did between 1959 and 1966. The Celts won eight straight league titles and with so much parity in the league along with free agency even Golden State will not work that miracle run. Next up for me is the one and only Robert Gordon Orr who followed up a season where he won the Hart, Norris, Ross, Conn Smythe and a Stanley Cup with a 139-point season (37 goals and 102 assists). The most recent player to make a run at the record was Brian Leetch when he posted 85 points in the 1994/95 season with the Rangers. 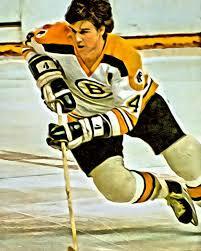 Orr was also a +124 in that year which is unheard of these days. 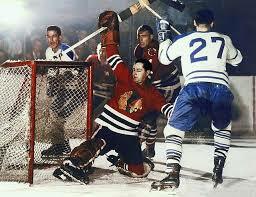 Another hockey record, which has a bit of showmanship to it is Gordie Howe playing professional hockey in six decades. I know, the last was when he suited up for the Detroit Vipers for one game when he was 69 but Mr. Hockey did skate one full shift against players 40 years younger than him. His playing full time over three decades is enough to make for a standard to be admired. I don’t count on anyone getting six decades any time soon. From Mr. Hockey to Mr. Goalie. Glenn Hall put on the tools of ignorance (hockey version) for 502 consecutive games and for the most part he did this without wearing a mask. Currently, a goalie might start 50-60 games so forget about any goalie playing all 82 games ever again let alone 502 straight. 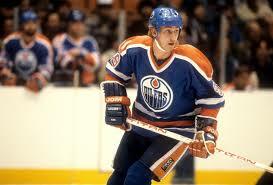 Of course, we can’t leave out Wayne Gretzky and his career points record of 2,857. No player is even close as Jaromir Jagr was the second spot holder at almost a thousand points behind the Great One. Joe Thornton is the closest active player at 1,465. This one can be filed under the header of safe. On to some baseball records and I will start with Denny McLain and his amazing 1968 season with the Detroit Tigers. McLain won 31 games that year and became only the 11th pitcher to record more than 30 wins in that century. In this day of starters lasting only five innings and pitching every five or six days we will not see a 30-game winner ever again in my opinion. McLain also is the only MLB pitcher I know who spent jail time for embezzlement,so he also has a different record. Joe DiMaggio was not the greatest Yankee of them all, but he has the 56-game hitting streak which will not be broken. Pete Rose went straight games where he got a hit but with how pitching is these days a player needs to be sharp every at bat for a couple of months to have a chance. 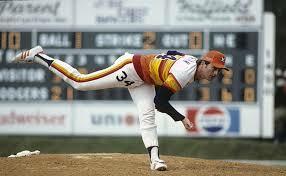 My favorite pitcher of all-time is Nolan Ryan and he has the distinction of another untouchable record in MLB. He played baseball for 27 seasons, racking up 5,714 strikeouts and just to add to his legendary status he tossed seven no-hitters which will also be tough to beat. Speaking of punch-outs, he also landed quite a few shots when White Sox third baseman Robin Ventura charged the mound and took a few off the noggin from Nolan. Still with baseball I don’t feel anyone will come close to Cal Ripken’s 2,632 consecutive games played. Players in this era seem to need a lot of rest and I’m sure it has something to do with the money invested in them. Ripken posted the record over 16 seasons and his number of straight games played will not be threatened ever. Now this is not a record but more of a feat accomplished by MLB pitcher Johnny Vander Meer with the Cincinnati Reds back in 1938. In one outstanding week Johnny no hit Boston and then four days later did the same thing to Brooklyn. For someone to beat this it would mean three straight no-no’s and with pitch counts in place and complete games a thing of the past it would seem this one stands for good. Now there is a reason the top pitcher in each league is awarded the Cy Young at the end of the season. Over 22 seasons with five teams Cy Young managed to throw 749 complete games and post 511 wins. ‘Nuff said. Onto the grid iron now and an iron-man streak which will not be broken is Brett Favre’s record of 297 straight games as a started. He even played the night after his father passed away and put up 399 yards passing. Peyton Manning was next at 208 straight and Phillip Rivers is the closest active player with 191 games. Tom Brady fans can calm down proclaiming his sturdy stature, but he has a pair of 100 game streaks, so he is not in the running. 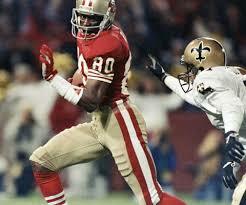 Jerry Rice was hard to catch in his prime and he will be hard to catch when it comes to career receptions. His mark of 1,549 over 20 years seems to be unreachable. He was adding to that total on a regular basis, even near the end of his time in the NFL. Larry Fitzgerald is the closest active player at 1,303 but he would have to put up some remarkable years to come close. At age 35 and with Josh Rosen throwing to him I don’t see it happening. Golf records are my final category and we will start with the Golden Bear and his 18 majors. There was a time when Tiger Woods had a legitimate shot at this one, but personal trouble and injuries have derailed his quest to be the best. Supporters will argue he still has a chance, but he will need to be at his absolute best in order to beat the current crop of players who are not afraid of Tiger. I think 18 will stand for a long, long time. And finally, a record in golf which is not mentioned very often and this one belongs to Byron Nelson. 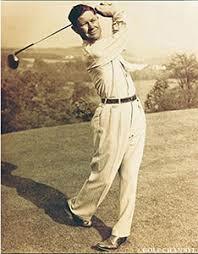 In 1945 Lord Byron won 18 PGA tournaments and he took top honours in 11 straight. Winning these days on the PGA is very tough given how many good players are on the circuit and busy schedules have players rarely playing 11 weeks in a row let alone winning 11 straight so we can safely say this will remain one of the tough ones to break. Now I started this with saying records are made to be broken and maybe some of these will topple at some point when robots are playing sports and not people. I for one am glad I won’t be around to see that come to fruition.